Home Horse Care Horse Behavior What Does it Mean When a Horse Snorts? What Does it Mean When a Horse Snorts? 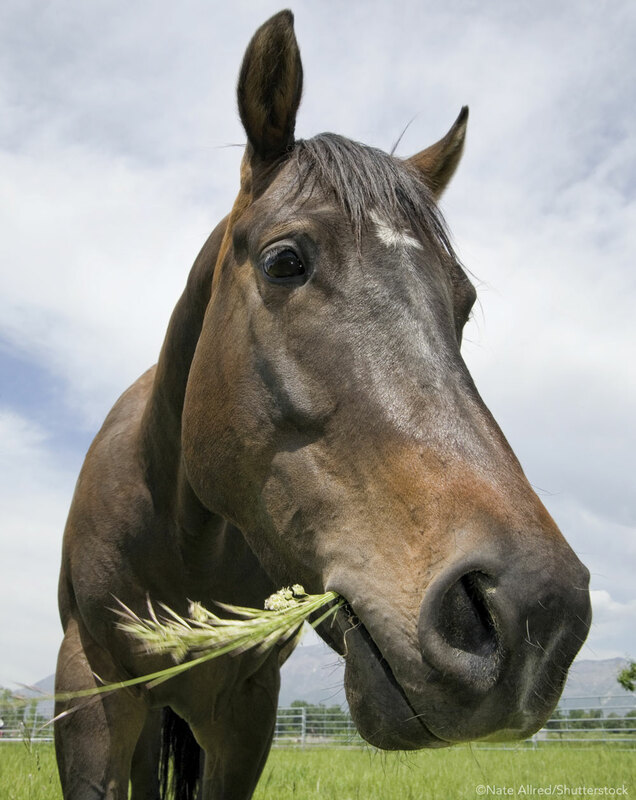 A new study reveals horse snorts as a leading indicator of equine happiness. We all want to have happy horses. But how can you know for sure that your horse is happy? A recent study* published in the peer-reviewed scientific journal PLOS ONE sought to answer that question by looking at a simple horse expression: the snort. The study, which took place in Brittany, France, was meticulous in its approach. 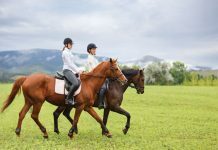 Researchers began by looking at 48 horses in three basic settings: lesson horses living primarily in a stall, lesson horses with access to pasture and barn equally, and pasture horses ridden casually. Before jumping in and recording snorts, the researchers categorized horse behavior that likely indicated happiness, such as an interested demeanor and relaxed ear position. They also established clear markers of unhappy behavior, such as ears pinned back in aggression or a show of disinterest, such as when a horse is facing a corner or wall. When observation began, snorts were reported using a microphone and recording device. At the same time, the observer documented the activity the horse was engaged in and any relevant information necessary to assessing the horse’s mood. To get a sense of each horse, the researchers created a “total chronic stress score” (TCSS). In particular, they noted conformation issues, such as a swayed back, which may cause pain and affect the horse’s general outlook. Symptoms of emotional distress were also logged, such as cribbing, weaving and head shaking, or aggressive behaviors like ear-pinning, biting and kicking. Horses in more natural circumstances snort more. This would indicate that snorting is indeed a reflection of contentment. Horses with lower total chronic stress snort more in general. This would also indicate a link between snorting and overall happiness. Once the snorts were counted (560 in all) and organized into categories based on the circumstances in which they were heard, the results were crystal clear. Snorting is more prevalent when a horse is in a pleasant situation, and horses living in less stressful conditions snorted more often. All of the horses tended to snort most while eating, during calm observation, or while quietly meandering around the pasture. Looking at the two riding school groups of horses, 189 snorts were heard while the horses were in their stalls, while 265 were heard when the horses were in the pasture. More significantly, no snorts were heard when a horse was aggressive or facing the stall wall. Eight of the horses never snorted in the stall at all during the times they were monitored. 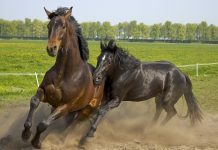 Habitual or negative behaviors, often seen while horses were in the barn, were absent when the horses were at pasture. Overall, the horses living continually in the pasture elicited the most snorts. The riding school that allowed their horses 50 percent time at pasture had almost as many snorts recorded as the pasture-only horses. The last group, in which the horses spent the most time in stalls, had the least number of total observed snorts. Perhaps the most interesting moment for the researchers came when four of the naturalistic horses were moved to a larger pasture with an abundance of grazing. During this time, the horses produced up to 10 times the number of snorts per hour than they had in their original pasture. While the specific purpose of this study was to determine the meaning behind the snort, it was not difficult to read between the lines. Overwhelmingly, it seems evident that horses, as herd animals, appreciate circumstances that allow them to be with other, familiar horses. Additionally, riding in a casual, loose-rein style allows the horse more mobility, which is associated with less back pain. The solitary barn stall, considered the Shanghai-La of horse homes, may not be making your horse happier. Instead, access to pasture—the more the better—allows horses to graze and socialize in a setting to which they are best suited. This study sends a definitive message. 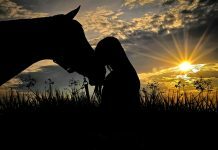 Horses are by nature humble creatures that have few basic needs: horse buddies, a field in which to roam, and exercise in a relaxed manner. When your horse is happy, you’ll hear it in a simple snort. Andrea Peck is a freelance writer and all around animal enthusiast. She has written hundreds of articles mostly focusing on science topics. Snorts are equal to “No” in horse language.